William B. Eerdmans Publishing Company, 9780802876416, 248pp. "Believe me" may be the most commonly used phrase in Donald Trump's lexicon. Whether about building a wall or protecting a Christian heritage, the refrain has been constant. And to the surprise of many, a good 80 percent of white evangelicals have believed Trump--at least enough to help propel him into the White House. Historian John Fea is not surprised, however--and in these pages he explains how we have arrived at this unprecedented moment in American politics. An evangelical Christian himself, Fea argues that the embrace of Donald Trump is the logical outcome of a long-standing evangelical approach to public life defined by the politics of fear, the pursuit of worldly power, and a nostalgic longing for an American past. 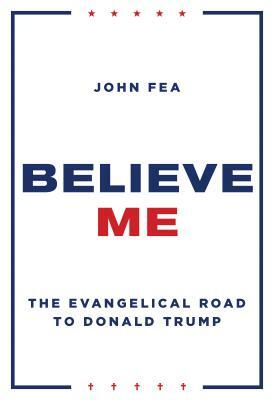 As insightful as it is timely, Fea's Believe Me challenges Christians to replace fear with hope, the pursuit of power with humility, and nostalgia with history.